Put glutinous rice, santan (coconut milk) and pandan leaves (screwpine leaves) into a steaming tray. Steam over high heat for about 30 minutes till the rice is soft. 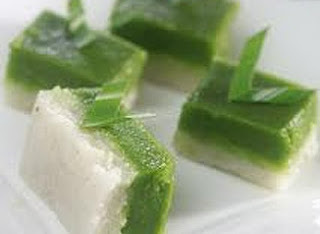 Remove from heat and press with a piece of banana leaf till firm and level. Mix all the ingredients for the top layer to get a nice green color. Strain mixture over the glutinous rice layer. Steam over low heat till custard is cooked and firm (insert a fork to check whether custard is cooked). Leave to cool completely before cutting into pieces.